Spring is a great time to get the dogs out to socialize with their friends off leash. There are some great parks for the dogs to play. The Azalea Dog Park in East Asheville is located just past the soccer fields on Azalea Road East. 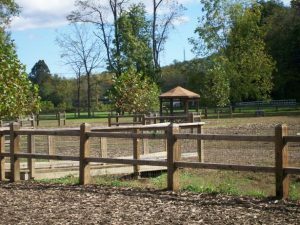 There is fenced in areas for large and small dogs, a gazebo, nice shade trees, benches, and water. There is a fishing pond with floating dock and sometimes you can see the dogs going for a swim. The French Broad River Dog Park in West Asheville is just off Amboy Road. This was one of the first dog parks in Asheville and is probably the most popular. It is about one acre. This park borders the French Broad River and connects to the rest of the River Park all the way down to Carrier Park if you would prefer to stroll on leash and follow the river for miles. Mills River Dog Park in South West Asheville is located at 124 Town Center Dr. in Mills River. It has 1.2 miles of multi-use trails, restroom facilities, playground, launch for canoe/kayaks and accessible fishing pier. Morris Broadband Dog Park in Fletcher Park at 85 Howard Gap Road in South Asheville. Fletcher Park is huge and has many amenities including a disc golf course. The river path has nice walking trails as well. In Hendersonville there is Dog Park in Jackson Park at 708 S. Grove St. Streams on both sides allows perfect field to run your mutts and restrooms are close by. North Asheville is campaigning for their own park. You can join the Friends of North Asheville Dog Park Facebook Page to get involved in making it happen. You can get more information at Asheville City Parks. Have fun with your muddy buddy.